The Kane Fireworks software is now obsolete and has been replaced by Kane Archiver and Kane Live, which are both free programmes. 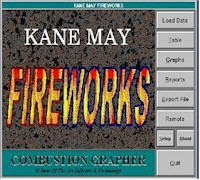 Kane May's Fireworks software is the easiest way to see data from your analyser on a PC. You can transfer data from the handset, see data in "real time" or see previously stored data. Fireworks uses Windows software giving full flexibility to view, manage and report on boiler performance and emissions data. Producing graphs or reports takes the press of a button. Compute automatically outputs per year of CO, CO2, Nox and SO2. Create "Before & After" reports to show boiler performance & efficiency after servicing. 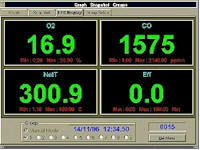 Ideal for a simple record of all boiler parameters. Connect the analyser's RS232 port to your PC's serial port to view data in "real time", updated every second - Perfect if you use a laptop PC to view boiler performance data. Once data is loaded it can be viewed on screen or used to generate reports. Once the data is analysed reports can be generated to give your client a spot check or boiler tuning, i.e. before or after results. Copies of the report can be generated on site or more commonly back in the office to be sent with other information such as work reports and invoices. Data and reports can be stored as reporter files for future use or saved to other formats for use in word processors or spreadsheets, or transfer data stored in the analyser's handset via the PC serial port.